Ancient China finds itself under attack from a horde of reptilian monsters. In recent years Hollywood has discovered that Chinese people like to watch movies, and we've seen not so subtle attempts to appeal to the cinema-goers of the world's most populous nation, with franchises like Transformers and Now You See Me moving their action to a country previously considered impenetrable by western pop culture. It was inevitable then that we would see a major Chinese-American co-production hit our screens. 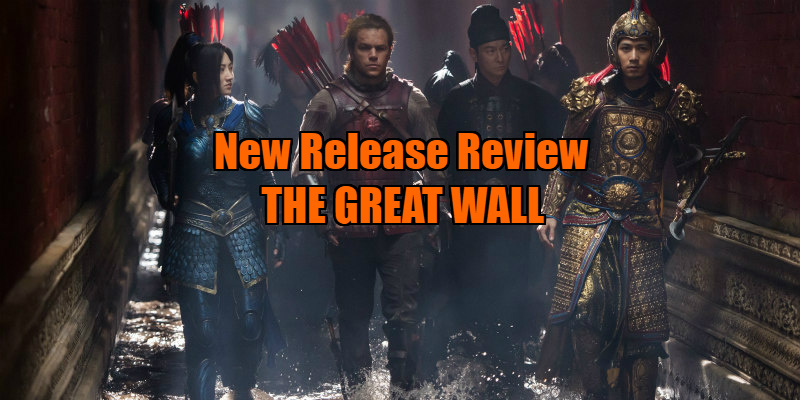 With a budget of $150 million, The Great Wall is an expensive experiment, but it's already turned a healthy profit on its late 2016 Chinese release alone, and even if western cinema-goers shun the movie, ticket sales among the considerable Chinese immigrant communities resident in most of the big cities of Europe and North America should be enough to make studio bean counters in Beijing and Los Angeles sit up and take notice. As anyone who watched the opening ceremony of the 2008 Olympics (overseen by The Great Wall's director, Zhang Yimou) will know, China loves to put on a show, and with its period setting, The Great Wall allows for a festival of pageantry. 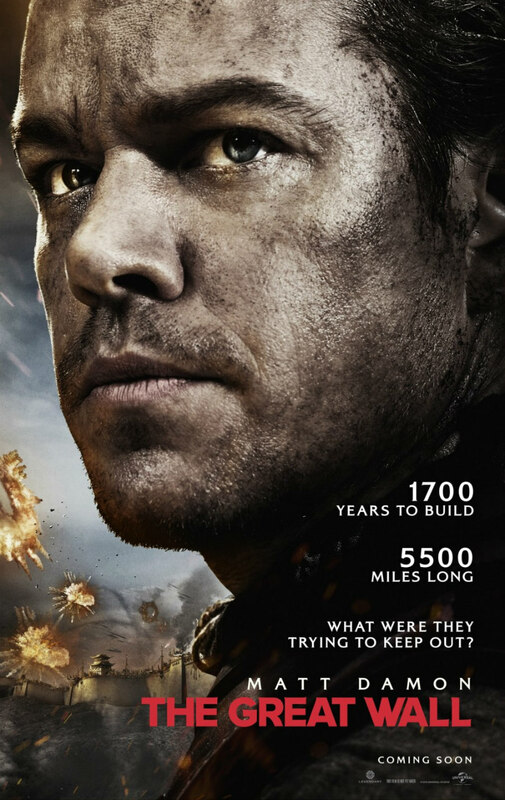 The lure for non-Chinese viewers is Matt Damon, who plays William, a Doug McClure-esque mercenary who somehow speaks with an American accent despite the events of the film taking place at least three centuries before Columbus set sail for the New World. Along with his Spanish buddy Tovar (Pedro Pascal), William encounters a giant lizard-like creature while on a mission in China to steal gunpowder. After chopping off the creature's arm, the pair are captured and taken prisoner by the army of General Shao (Zhang Hanyu). While imprisoned in a fortress built on the titular fence, William and Pascal become embroiled in the midst of a giant battle as hordes of the reptilian creatures attempt to scale the wall. Along with fellow English speaking and American accented prisoner Sir Ballard (a wasted Willem Dafoe), the pair must decide whether to make their escape or stay and fight alongside Shao's army. So is The Great Wall a cynical attempt to exploit a growing audience or is there enough entertainment value here to legitimise its production? Well the answer is a bit of both really. It's a big dumb blockbuster, but in the hands of Yimou, it's as big as it's dumb, boasting a scale and spectacle absent from most Hollywood productions. There's some stunning imagery here, and Yimou shoots the action in a way that justifies donning a pair of 3D glasses, getting great value from the depth of the wall itself. With warriors abseiling and bungee-jumping into a vertical melee, you'll find yourself clinging to your seat if you're even slightly bothered by heights. If Yimou's visuals provide The Great Wall's highlight, the script, on which a total of six writers toiled, is its nadir. The characters are so cardboard they'd crumble in rain, and the dialogue is there simply to advance the plot and fill in backstory. With its outrageous concept, The Great Wall is a movie that should be a lot more humorous than the often po-faced drama we're presented with here. In an attempt to avoid 'white saviour' accusations, Damon's William is written as lifeless, and ultimately ineffectual as he takes a back seat to Jing Tian's bungeeing badass Lin Mae, the film's secret weapon in every sense of the term. Every time we expect a one-liner to emerge from Damon's lips he remains stone-faced. What would Jack Burton have done in this scenario? The Great Wall is in UK/ROI cinemas February 17th.